In today’s constantly evolving digital scenario, it hardly matters about the type of business entity, be it a small or a bigger one; the growth of the company is completely defined on the ardent factor of its IT department which takes its prominence in maintaining the entire premises. 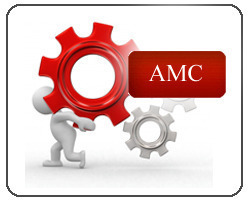 The AMC service provider has always had their support deliverables to the numerous clienteles towards the periodic maintenance of the network, peripherals and the client-server systems further ensuring that there is no ongoing breakdown in the systems. In fact, the network infrastructure transforms itself as a crucial component towards the proper safeguarding the database which constantly accumulates in the data center. The vital link between the server and the data center also requires constant maintenance. The AMC service providershave constantly been very vigil and further ensuring the maintenance of the network architecture to the optimum levels so that there is no major breakdown. The client-server infrastructure incorporates within it the multiple workstations being connected to the local area network (LAN) to the central server. This client-server architecture has to be well maintained so that there are no breaks among the multiple workstations. In fact, it can be said that, the success of the company towards its optimum network connectivity is completely based on the internal client-server architecture, which actually governs certain project accomplishments. In a broad term peripherals or any external hardware device that is being connected to the computer system to enhance the performance and in the due course expand the computer’s capabilities. The peripheral support could be an ideal initiative to completely safeguard printers, scanners, digital cameras, web cam to name a few. The peripheral support has been the most vital component for the AMC service provider as they are completely responsible for either repair or replace the necessary peripherals for the smooth conduct of the IT segment. VRS Tech has been assisting numerous corporate entities across the landscape towards the support initiatives towards their network, client-server, and peripherals. We have had a tag name in the market for being one of the chosen vendors to be a part of this endeavor. In the event that you are earnestly looking forward to safeguarding your IT department towards any presumable eventualities, please approach VRS Tech and call us at +97143866001 so that our support team could get in touch with you for your endeavors. Please visit our official website www.vrstech.com for more information.